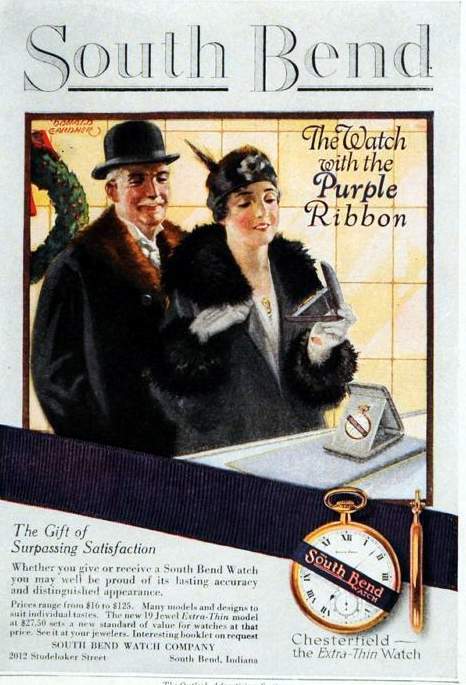 1. great graphic – has to be the coolest watch ad of all time! 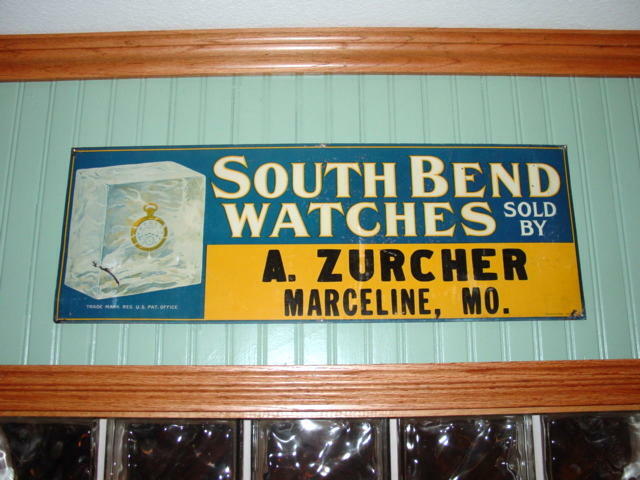 Since South Bend produced less-expensive lower-jeweled as well as more-expensive higher-jeweled watches throughout its history, this claim is remarkable. 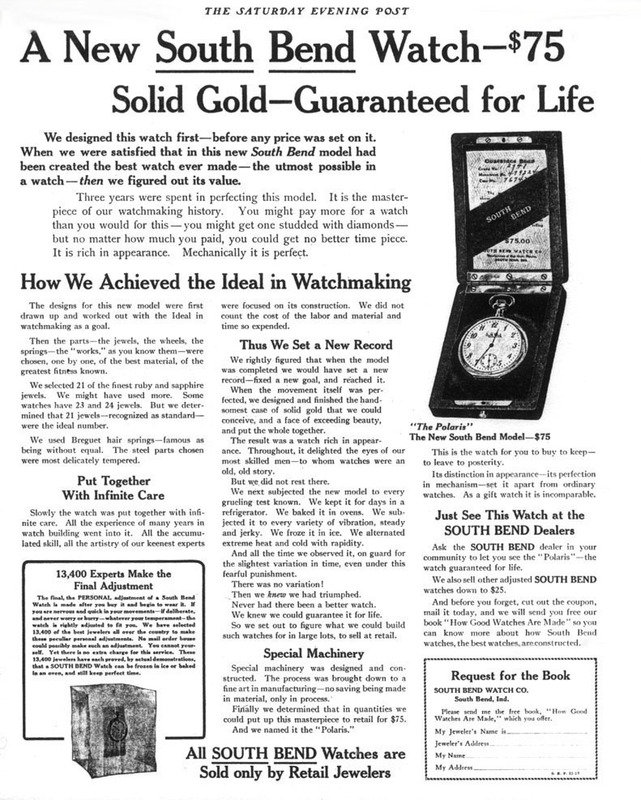 South Bend subsequently formed the “Studebaker Watch Company” to sell “Studebaker” watches by mail-order only! 'The Studebaker' Railroad Watch sign I found at an online auction site. Heavy gauge steel, 18.5" X 7.75", and it went for $1,140.00. Image found on a online auction site. South Bend’s "Block of Ice" button. Does anyone know how South Bend "froze" the watch in the block. 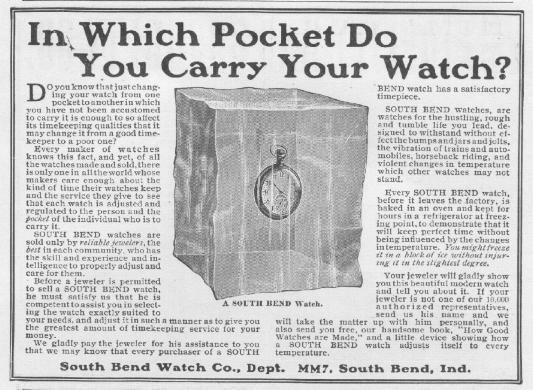 I am guessing that, in those pre-waterproof days, South Bend cored a watch-size channel into the heart of a block of ice, it then inserted the wound watch, and it finished up by sealing up the block with a nearly core-sized plug of ice. If so, this feat wasn't really different than running the watch at 0 degrees Celsius. Test one would be freezing it into the block while it is simply submerged in water. Test two would be as Ethan suggests, where a channel is carved out and then plugged after the watch is wound and set in. Test three would be covering the watch with a protectant that would have been available at the time...something like a shellac or a clearcoat...then doing test one on the watch. My initial guess is that tests one and three would crush the watch as the water freezes and expands. 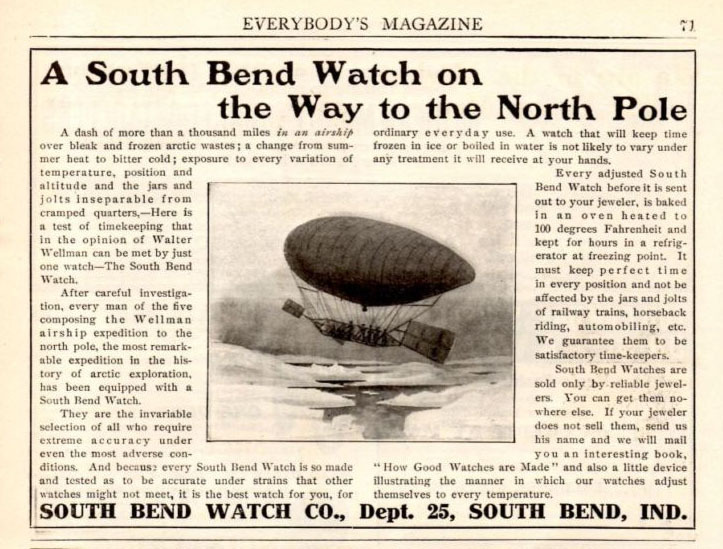 A 1906 South Bend Watch Ad - On The Way To The North Pole. Not in a block of ice...but close to it. I can see another possible way of freezing it into a block of ice. Taking into account both Ethan and Tom's ideas and the fact that the watch had to be exposed to 40 or 50 degrees below 0 and survive in an open gondola airship at the North Pole this is how I think they did it. 1. Take the watch and a bucket of water into a freezer. Dip the watch into the water and out again quick enough that no water enters. Hold the watch out until the layer of water freezes. Keep dipping and freezing until the watch is covered with a protective coating of ice (the waterproofing). 2. Still in the freezer...hang the coated watch in a small expandable container of water (in 1906 perhaps canvas lined wicker) so the small volume of water will expand outward as it freezes and not crush the watch (the crush-proofing). 3. Now have a container half full of pre-frozen ice. Set the small block with the watch inside in the middle, weight it down till it freezes to the half-block then remove the weight, fill with water, and continue freezing. South Bend Watch "Block of Ice" sign. 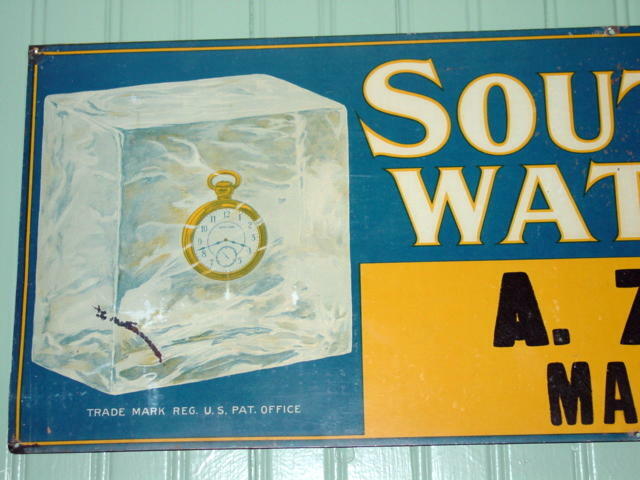 South Bend Watch "Block of Ice" sign (detail).